The company, which offers drilling rigs for diamond wire, impact drilling and core drilling, presents to the visitors of the fair, the best seller of COMMANDER drilling rigs, the only machine in the world capable of drilling horizontal holes 5 cm from the ground at a drilling speed of 25-30 m/h, thanks to its 14.5 bar compressor on board. 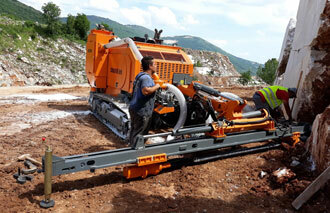 "It is by far the best choice for applications in marble and granite quarries. 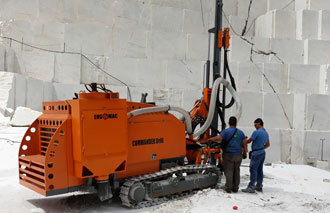 The machine makes vertical, horizontal and inclined holes", emphasizes the general manager Costas Kindonis. In addition to the machines, the company also supplies the MARMODRILL drill capable of drilling horizontal holes 5 cm from the ground. The GEOBRIL drill makes FTH and core drilling (conventional and wireline) at a depth of more than 150m. Present in the Balkans, Eastern European countries, Russia and North Africa, Ergomac chose the International Fair of marble and granite, Vitoria Stone Fair, as a communication channel to showcase its products and develop market expansion actions. "Our participation in Vitoria Stone Fair is related to our intention to extend the sales of these machines in the market of ornamental stones of South America," points out the professional.